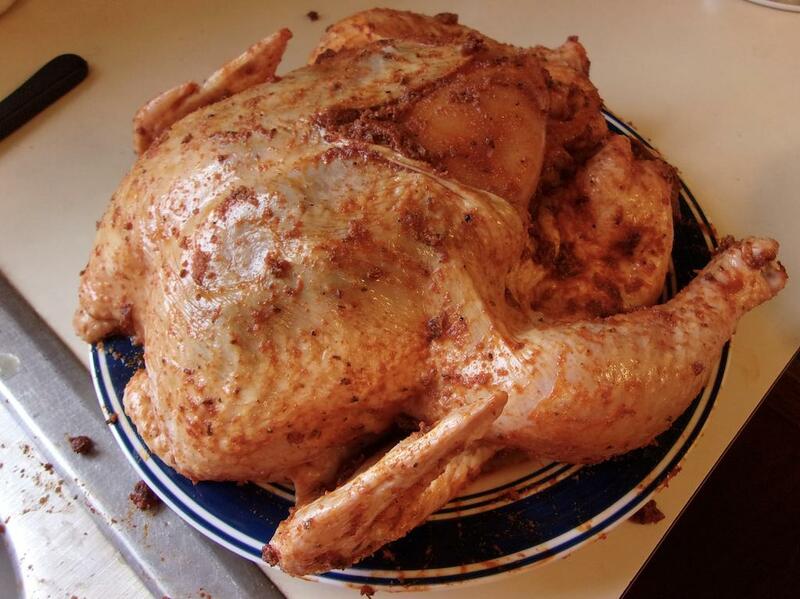 Coat the entire chicken with the paste, inside and outside. Be sure to get it under the skin of the chicken where possible. Let sit in the fridge for at least 5 or 6 hours, better yet overnight. 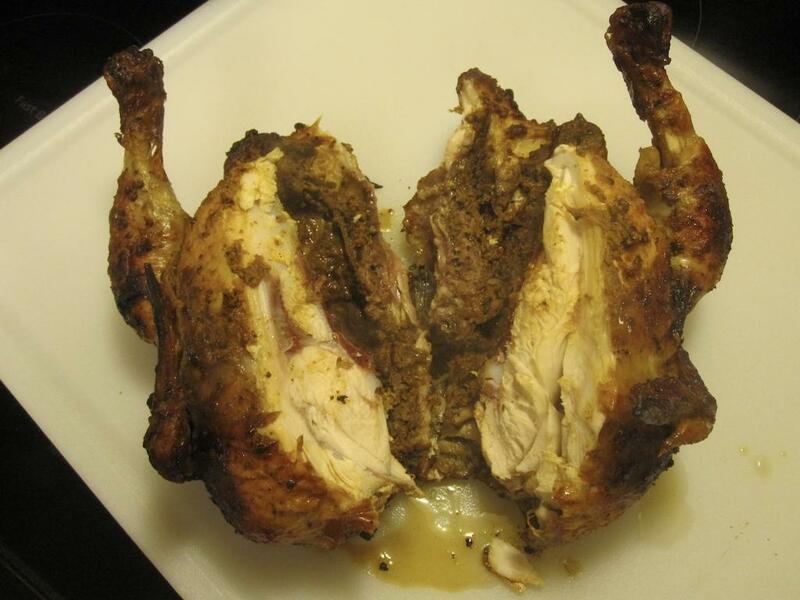 Ideally, cook in a rotisserie. You can use the oven if you need to. 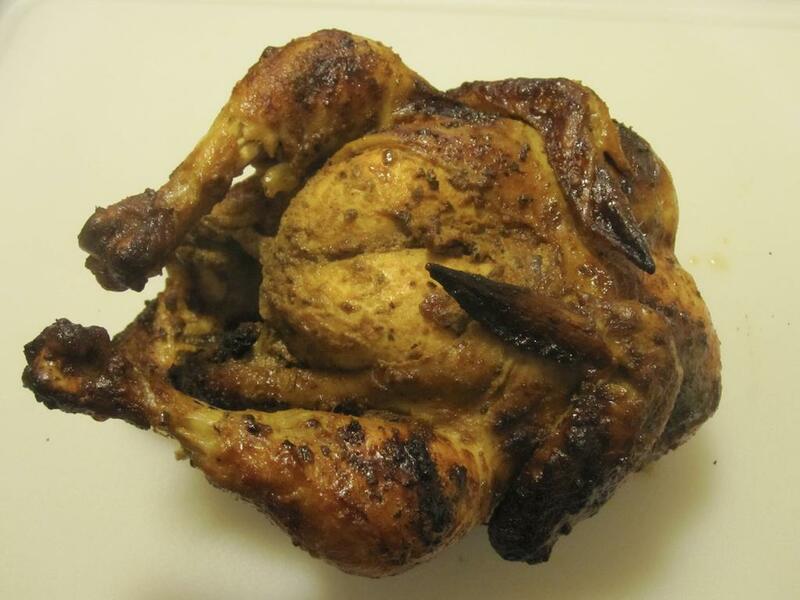 Remove the chicken from the rotisserie and let it rest at least 5-10 minutes. LET IT REST. Got any Cuy recipes, Chris? Stay tuned... I plan on using the smoker this weekend, if the forecast for warmer weather holds. I'm thinking baby back ribs. That will work. Some of the guys were asking about groundhog recipes. I figure what works for Guinea pig will work for young groundhog and I wouldn't be giving away long held family recipes. Paprika goes perfect with just about everything. Yes it does, Skeez. A few years back I got what were supposed to be some heirloom hot banana pepper seeds from friend who owns a small greenhouse and nursery. The problem was they weren't hot, but in the poblano/ancho heat range. They had a great taste though and they ripened quickly to a nice Mexican red. I had bunches of the things canned, frozen, and dried. I'm looking at the dried ones one day and I'm wondering what to do with them. Then it his me, paprika! Not so hot as to dominate, but noticeable enough to give it a little "Hello sailor!" appeal with the depth of flavor of the fresh ones. Now my problem is I go through it so quickly it's gone in a couple of months after making it. This May I'm putting in an extra patch, I'm thinking homemade chili powder and paprika. BTW, she accidentally gave me the wrong seeds. The ones she meant to give me are so damned hot it makes it feel like the skin on your forehead is peeling off while you drip sweat. I'm glad I didn't get them! I've tried growing paprika from seeds (from Hungary) a few times. I have bad soil and a relatively short growing season. It was not too successful. So, I have to buy commercial paprika. Mostly from a store that specializes in spices. A friend brought some back from her trip to Hungary in 2011 and its pretty good. BTW, Hungary is pretty decent in winemaking too. A banana pepper is simply a Hungarian Wax pepper under a different name. As the hot, mild, and sweet ones grown in this area all look the same, you can get some surprises. Plus, they all cross pollinate with each other. BTW, have you tried raised beds for gardening with a little hoop house to go over them on nippy early fall nights? I've eaten hot banana peppers all my life but nothing like what this woman has. They're in the Cayenne heat range with thicker juicer walls. When I was in HS and College and the Iron Curtain was still up, Hungarian wines were one of the few products making it over here from the East and they were dirt cheap. It was a date wine, unlike the Night Train and Mad Dog you swilled with your buddies. Those college girls were usually beyond being impressed by Boone's Farm and the oddly named Champale which was simply a flavored malt liquor. It's killing me that I can't remember the full name of an older, now deceased, Hungarian man who lived down the road from us. Frank made mead for both private and local consumption, but had to drop the latter when tighter laws for wine and beer bottling processing and procedures started in the early 90's. He still sold it from behind the counter at his produce stand, but he had to know you. That guy was an artist with honey and fruits. He had cases of the stuff going back to the 40's and would give bottles to local couples to drink on their wedding nights as he claimed in his section of the old country that newly married couples drank mead to insure they would conceive a son. When Frank died his daughter came in from the West Coast and poured it all down the drain. I couldn't believe it. Frank sounded like a whole bunch of fun. Hungarian wines are over here today... I've been trying to uncover them and they are rather quite good, especially a couple of the furmint ones. Those are now a permanent item here and in quantity so I never run out.